It used to be that you only had to worry about extraneous foreign usage fees from your credit card company when you set foot in a foreign country but; thanks to the Internet, you can waste money on foreign transaction fees from the comfort of your own home. Last month I found out just how easy it is to tally up yet another fee on a credit card by purchasing a new part for our Kenmore dryer. After dealing with the cruel and unusual punishment that is Sears' customer support, which simply bounced me from automated menu to automated menu, I decided to take things into my own hands and find a replacement heater online. A quick search revealed a company selling a brand new heater that was available for overnight shipping for less than the cost of bringing in a Sears' repairman. After a cursory inspection of the site's reputation I ordered a new heater and gloated to my friends about the money I had saved. It wasn't until the end of the month that my credit card company offered an early Halloween surprise by charging a Foreign Transaction Fee for my parts purchase. Confused; I went back to the store to make sure I hadn't mistaken the dollar sign for some off the wall currency I had never heard of, but in fact all prices were in U.S. dollars. However, it turns out that the company is headquartered in Toronto and, as such, processes credit cards in their home country. Despite purchasing my new dryer part in good ole American greenbacks, the purchase went a bit, "Loonie" and earned my credit card company a few extra bucks for the trouble of sending money up north. I'm not alone in getting hit with a Foreign Transaction Fee. "I've seen it; in many different agreements where they talk about the fact that you will be charged I guess it's a 3%, and now some of them are raising it to 4%, fee." said Adam Levin of Credit.com. These fees are tucked away into the fine print of credit card agreements and I think we are all aware of the fact that using our credit card to purchase something in a different currency will bring about a fee, but being charged extra for purchasing something in dollars is a bit mind boggling. 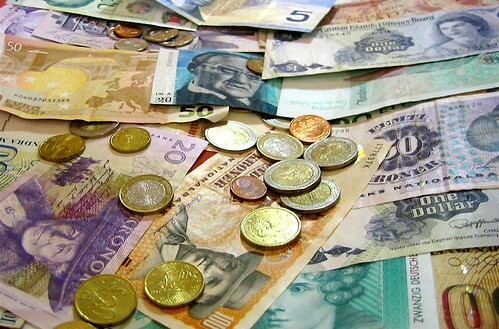 The bad news is that avoiding a foreign transaction fee will require extra diligence or searching for a new credit card. Without investigating where a company is going to process your credit card, something that isn't always readily available, it isn't immediately clear whether you will be responsible for paying an extra fee. As far as switching to a card that doesn't charge you extra for paying a foreign company in dollars, Levin suggests that credit unions or small bank cards may be your best bet; but cautions that ultimately credit card companies will pick up the fee somewhere else, just like they have in response to the Credit card reform act.